Everyone has to deal with crises in life including Christians. And sometimes the reality of life can seem unbearable. But we can rest in the knowledge that God loves us He weeps in our times of pain and He can be glorified through suffering. 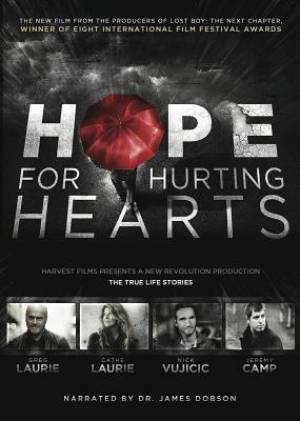 Narrated by Dr. James Dobson Hope for Hurting Hearts tells the stories of how Greg and Cathe Laurie Jeremy Camp Nick Vujicic and their families dealt with times of trial. Each of these individuals has stood at a spiritual crossroads" marked by challenging and painful circumstances and each has chosen the road of trusting following and glorifying God. You will be encouraged by these intimate accounts which give a glimpse into God's perspective on suffering and declare that there truly is Hope for Hurting Hearts. Hope For Hurting Hearts by Various was published by Word in November 2013 and is our 782nd best seller. The ISBN for Hope For Hurting Hearts is 0818728010528. Be the first to review Hope For Hurting Hearts! Got a question? No problem! Just click here to ask us about Hope For Hurting Hearts.